Killar_of_giants had the most liked content! I&#39;m surprised it made it. We wouldnt get down the road without the police ripping us a new a hole. The fines would be 5x the value of the car. Looking forward to seeing you tackle the build. A big project, credit to you for saving it. Should be impressive when done. If no-one local buys it and your willing to ship it, Ill buy it if freight is reasonable to Brisbane. Shame about the bonnet with all the effort you put into it. At least the gear knob and cage padding isnt too much of a pain. so what happened, did they give you a hard time? Never mind, didnt realise I had 2 emails. Bummer. Just the bonnet? Finally got around to installing the refurbished dash that I got back a few weeks ago. From when I did the conversion I had the ECU check engine light dangling off a cable hanging under the dash. Ive been wanting to have the check engine light in the dash under the park brake light but looking stock. I bought some 3mm translucent amber perspex. Did all the cutting on my triton table saw so that the lens would be recessed. I sanded the top of the perspex with 600 grit to take the shine off and no longer see thru. Filed the notches out for mounting and used a soldering iron to melt the pre existing tabs in the dash facia to hold in the perspex in. Reworked the PCB on the cluster to suit so I could use the stock dash bulb and location. It doesn't look 100% stock but it will do. I cleaned all dash components with a toothbrush and dish washing liquid. Even pulled the fins out of the vents. 40+ years of dirt and grime. time consuming but worth it. I also replaced the $20 dollar Nardi copy with a genuine one the family bought me for last xmas. cheers. I bought a passenger door off you a while back and you gave me a few door cards aswell which I ended up giving to Grant in NZ. Took me for a drive, love your car. Ive been following your build thread for a couple of years and always look forward to updates. Yeah was looking to have a chat but no-one was by the cars (yours and MS's red ke55) when I stopped by. I didnt take my car this time around. 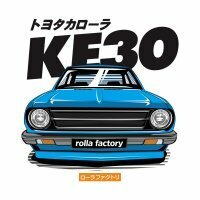 I have a KE30 2 door. Looking good. Been following this build for a while now and got to have a sticky beak at all jap. Those ITB's look flash. ke30 Drum to Disc conversion & Coilover conversion. 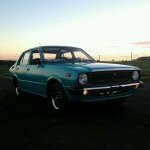 Useful info regarding front suspension https://www.rollaclub.com/board/topic/38573-tie-rodtubeke70ke3x5x-faq/ No bolt in diff options to handle boosted 3sge but the info is here regarding modifying diffs if your a rolla freak willing to do the research. I remember this build, very nice. Facebook seems to be where the parts are at these days, especially now that tired ke's are rising in price and wreckers are on the decline. Photobucket hasnt been good to forums either. Perhaps when I start working on my cars again Ill start a rides thread to contribute the little I know.